This review is about item#17493263. As the wire pulling the ground plate of the drive halo was broken, I repaired it with this product. When I asked the farm equipment shop, I didn't ask for anything, but I was able to repair it cheaply. This review is about item#17493367. Easy to use in a size that is just good with SUS affordable price. This review is about item#17493464. I used it for the suction pipe foot valve of the hydrant pump. It is OK in 3 mm. Price is saved cheaply. This review is about item#17493385. No problem at all. Cheap and rich in length variations. At the time of purchase, both ends were wrapped with vinyl and there was no chance to get injured, and it was easy to manage because it did not break away. This review is about item#17493306. I am easy to process with sleep, I think that the degree of tension is good. This review is about item#17493297. There was also flexibility as I thought, it was good to purchase it very easy to use. I was looking for 2.5mm, but because it did not exist in the Monotaro brand, I purchased 3.0mm. Although it seems that there is enough strength, it is made of stainless steel and not flexible Because it does not bend, processing seems to be difficult. However, Cosupa was enough and there were coupons and it was even cheaper to purchase. Because it is strong against rust by outdoor use, it can be used with confidence. This review is about item#17493403. The solar panel has stayed at the clamp, but just in case, I installed a fall prevention wire. Because it is stainless steel, it is hard to rust and is ideal for outdoor use. It was easy to handle such as cutting. This review is about item#17493342. It can be used normally. I think that cost performance is good. The strength was also exactly good and the workability was very good. There is no worry of rust with stainless wire. This review is about item#17493428. If it is a chain, it can not turn around with a pulley, it can pass through a narrow gap, and it can be easily cut and caulked to make it as long as you like. I cut only every 1 meter and I could only get nine, and the remaining two were less than 1 meter. Although it was a description of 10 meters, it was actually less than 9 meters. I am sorry that quality is perfect. This review is about item#17493315. 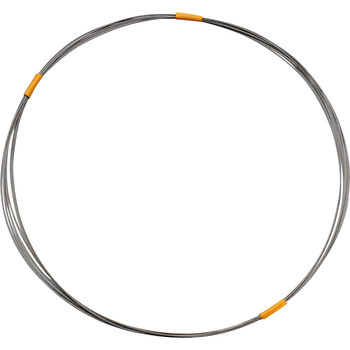 To prevent the loss of the drain cap of the engine pump, this wire is used to connect with the main body. I feel soft and nice. This review is about item#17493272. I am allowed to use it when hanging panels etc. Because our company's handling of furniture is sloppy (lol), I often use 20 m volume We have ordered each use. So always breaking new article! (Lol) The coated oil is also not gummy, just wipe a little with the waste Because I can give it to customers, it is easy kore too. I am saved. This review is about item#17493394. This review is about item#17493358. It was easy to use as a satisfactory product without problems at all and usability was good. Especially it can be used without problems. I think that it is good because the price is low and there is no problem with quality. This review is about item#17493324. I opened it and it was disappointing. There are two thorns and it does not become a product! This review is about item#17493437. I use it to fix Yoshizu and to prevent the housing of the security camera from falling. Because it is stainless steel, you do not have to worry too much about rust. The price is also very reasonable, I think that if you exchange regularly this will lead to a higher safety factor than a high product. This review is about item#17493333.